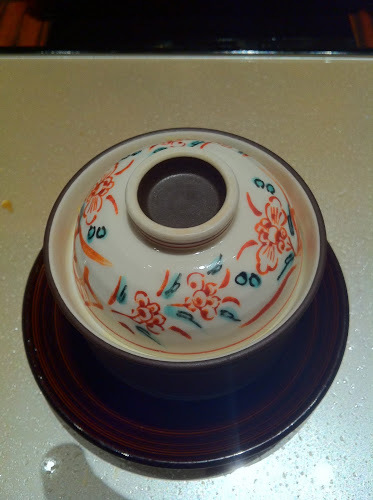 As I've already visited Petrus and Summer Palace to make use of the 2-for-1 Shangri-la birthday deal, I thought it only fitting to go to Nadaman for my own birthday. I've gone from never eating at Island Shang to eating at three of their restaurants within the span of three months! I was surprised by how large the restaurant was, with a number of separate rooms including the main dining room. I really liked the interior which was done up tastefully and much more low-key than the other Island Shang restaurants. It felt so peaceful in there, especially with the very soothing green tea. Too bad we weren't seated by the windows which offered a pretty good view of PP amidst the trees. From top clockwise, homemade anglerfish beancurd with salmon roe (in the bowl at the back), mini abalone and gingko nuts, salmon with cheese, mackerel sushi, and deep fried prawn. I enjoyed the mackerel sushi and really really liked the fried prawn which was light and crispy and melted in my mouth! The beancurd was also silky smooth and paired surprisingly well with the salmon roe. 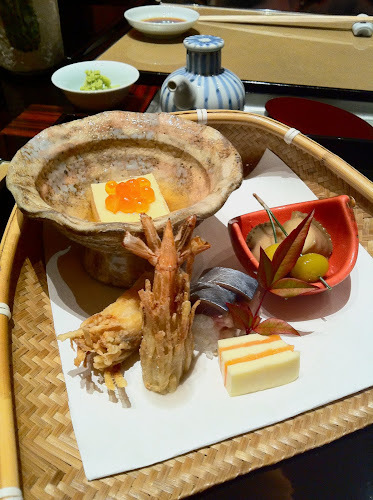 Unfortunately, I don't eat abalone and the salmon with the cheese was a bit of a turn-off for me - I can never understand why people like to pair sushi with cheese, especially when the cheese tastes like Kraft singles. 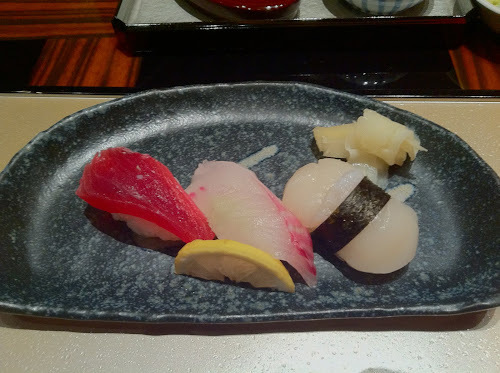 Sashimi of ark shell, chu-toro, and red snapper. I didn't try the ark shell but the red snapper was a little bit tough for my liking. Luckily, the chu-toro was the saving grace and I was quite impressed that they gave three decently thick slices of it! Chu-toro is my favourite grade of tuna, coming from the back part of the belly and thus slightly less fatty than otoro but still far more melt-in-your mouth than regular tuna. And this one really melted in my mouth, super tender and fresh. 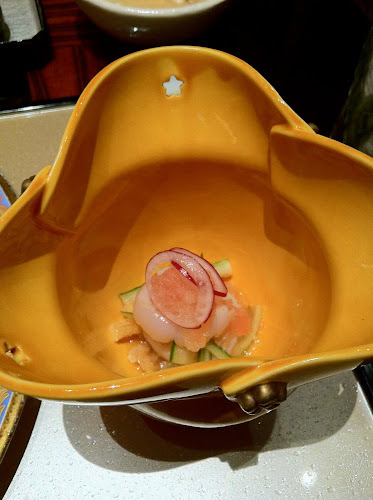 Scallop with citrus fruit, cucumbers, and some fried bean curd on top, all soaked in vinegar. The scallops were lovely and plump and really quite delicious but I found them to be completely overpowered by the citrus fruits (in particular the pomelo). I could hardly taste the scallops with all the ingredients going on. I believe the menu called this a rice casserole, which included mushrooms and vegetables. It was really comforting and hearty, perfect for a cold winter's night. I was surprised how healthy it made me feel too! I could picture myself out in a cabin in Hokkaido watching the snow fall, eating my bowl of rice, and reading a Murakami novel :) (FYI - for any Murakami fans, 1Q84 surpassed my expectations!) The rice had a great texture too - slightly moist and soft, yet not as sticky as a risotto...Just very plump, if that makes sense? 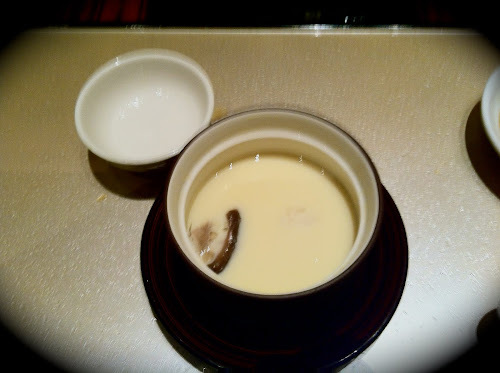 It also came with a nice bowl of soya bean soup on the side though I would've preferred miso. The dessert was meant to be a coconut purple taro soup with red beans but I'm not a big fan of red beans or coconut and so asked if they could change my dessert to ice cream. They were happy to comply :) They had a selection of normal ice cream flavours (green tea, sesame, vanilla) but I decided to opt for their korean citrus sorbet and it was the perfect way to end the meal. It really tasted like those Korean citron teas with clumps of citrus peel inside. Delicious! Apparently this was flown in from Japan. My partner ordered one of the dinner sets that was priced slightly cheaper in the range of $600? This was just spinach and maitake mushrooms but was again a delicious and light way to start the meal. This was the crab roe salad which as you can see was served with a very generous amount of crab roe. I usually don't like Japanese salads too much because of the crazy amounts of mayo used but this one was actually quite alright and I had wished I had taken more before it was polished off! Tuna, snapper, and scallop. Didn't try any of these but I'm sure my chu-toro was far yummier hehe. My friend did say that the scallops tasted really fresh though. It was funny that they asked us how we would like our beef cooked when the slices were so thin! Felt like beef for sukiyaki but I'm not complaining because I love that stuff! The beef was pretty succulent and despite how it looks, wasn't all that oily. Really enjoyed the sides as well - in particular the broccoli when doused in the sweet sauce. All in all, this was a pretty satisfying meal that left me pleasantly full. The service was great, ambiance relaxing, and the food was definitely above par. It was such good value too with the 50% discount - I think our whole meal came up to a total of $770 plus service charge! Will definitely be back for their Ladies Sushi Set lunches!